Scroll down to see our selection of standard shower chair commodes for sale. Standard shower chair commodes are used by the elderly or disabled in homes, hospitals and assisted living facilities. We carry a large selection of standard shower chair commodes for sale including standard aluminum shower chair commodes, multi-pack shower chair commodes, Active Aid standard shower chair commodes, shower chair commodes with footrests and Aquatec Ocean commode and shower chair combo. What is a standard shower chair commode? Standard shower chair commodes are rolling toilet chairs, equipped with a pail, commode seat and water resistant frame that can be used bedside, over a toilet or in the shower. 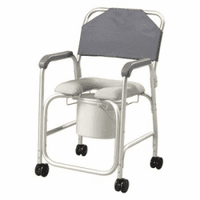 Standard shower chair commodes allow a care giver to easily transport an individual with little to no strain. The multi-functionality of these standard shower chair commodes can reduce the number of transfers required to perform hygiene tasks.